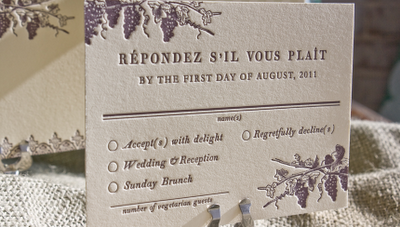 Remember the Storybook invitation suite? 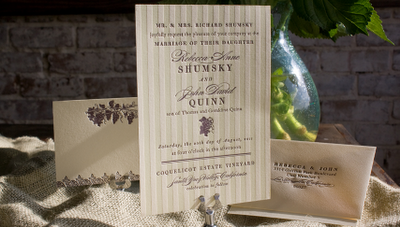 Well, today we are pleased to give you a look into the details of the wedding that inspired our newest Collection piece. 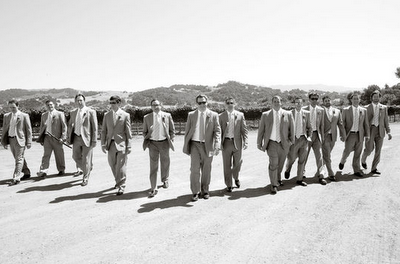 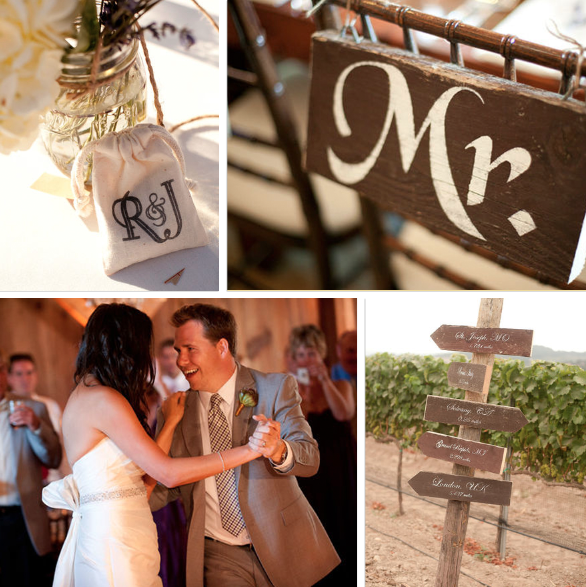 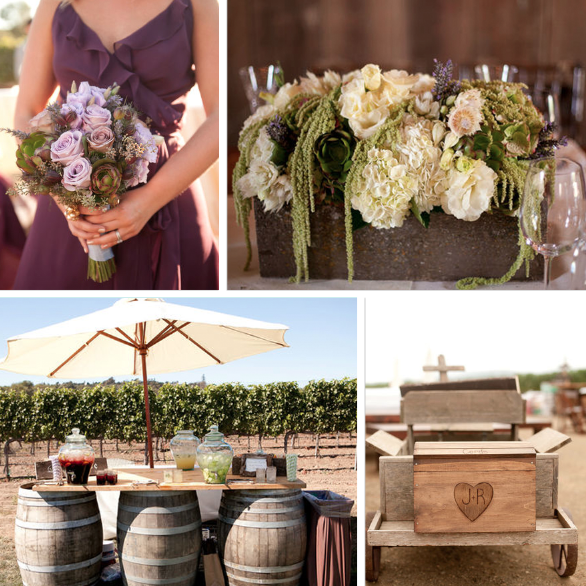 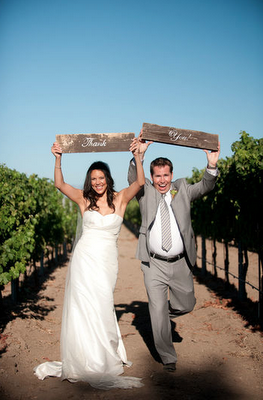 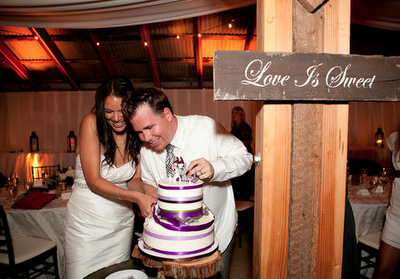 Rebecca and John were married at a vineyard in Santa Ynez in August. The wedding was a perfect mix of casual and elegance as the bride intertwined the classiness of wine country with shabby chic barn decor. 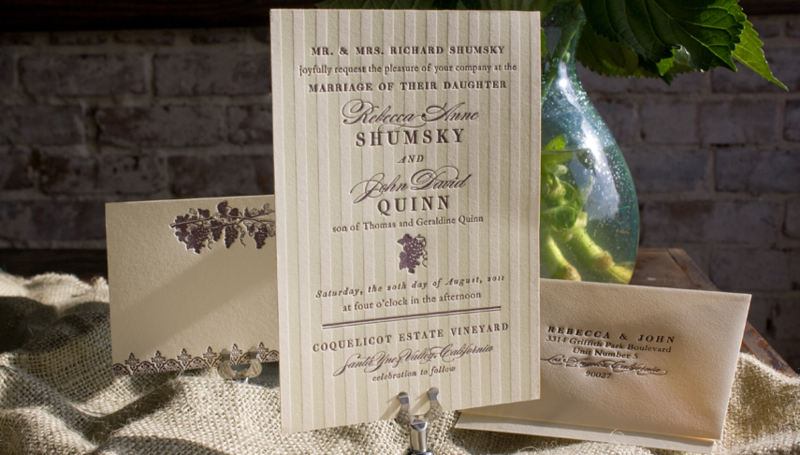 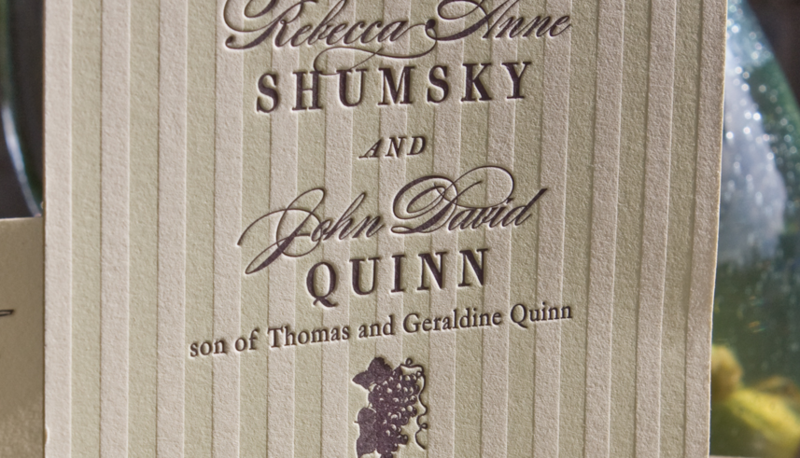 When Rebecca mentioned that she and her groom were going to be wed at a vineyard in California, we immediately envisioned vines and grapes for her stationery. 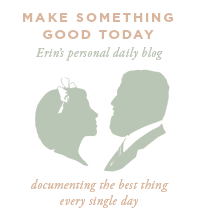  The bride first approached us to design her postcard save-the-dates. 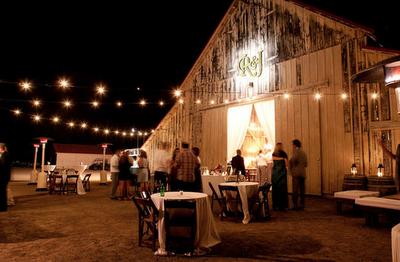 On the front of the postcard, we used a photo of the barn where their reception would take place. 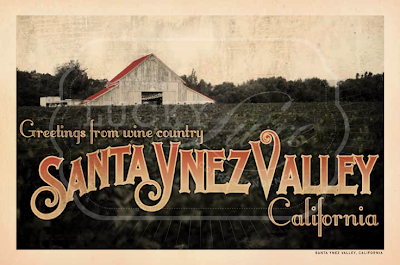 Rebecca wanted the postcards to have a vintage feel with a twist, so we antiqued the photo but left the roof red. 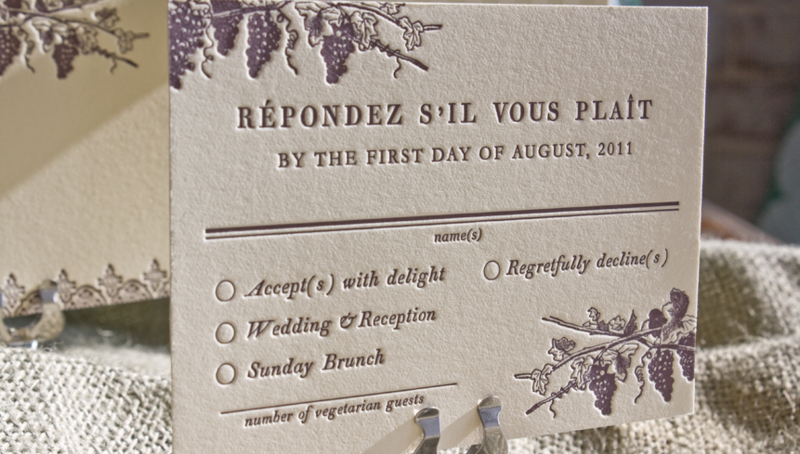 We designed everything from the invitation suite to the ceremony programs for this wedding, and it is one of our favorite weddings (and brides!) 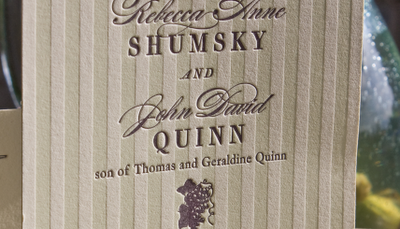 to date. 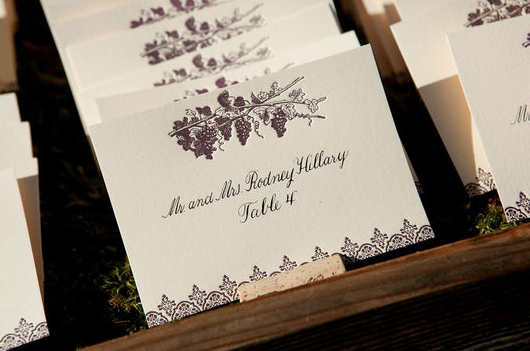 The wedding colors were sage and lavender, so we were able to create a traditional invitation suite with a hint of romance and whimsy. 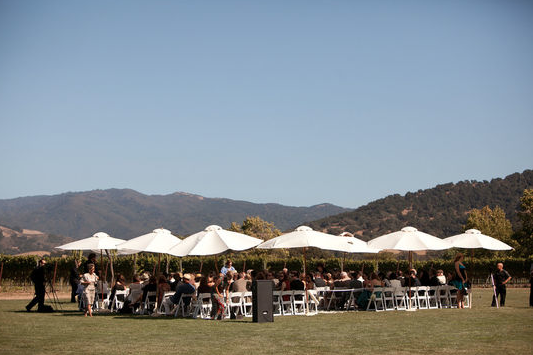 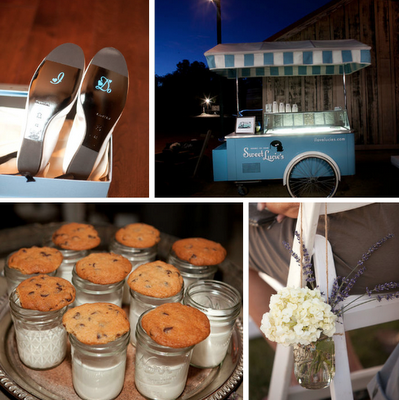 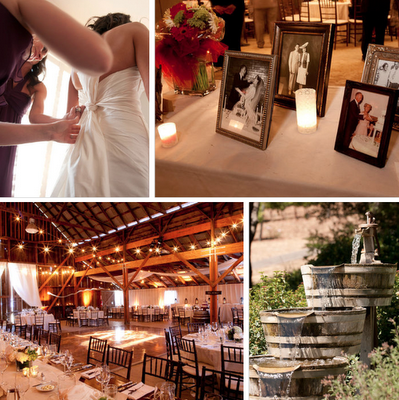 The ceremony was held outdoors at the vineyard, and the reception at a barn on the property. 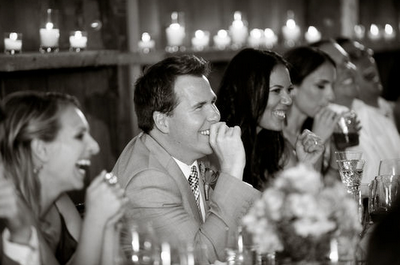 Old photos of the relatives of the couple were displayed amongst candlelight and beautiful flower arrangements. White lights were hung from the beams of the barn’s ceiling, wine barrels adorned the property, chandeliers created a romantic ambience. 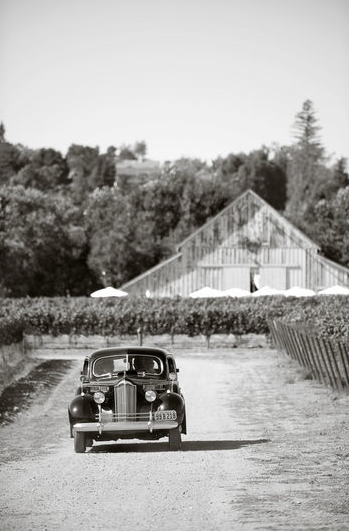 The bride arrived by car and made her grand entrance amongst the hills of wine country. 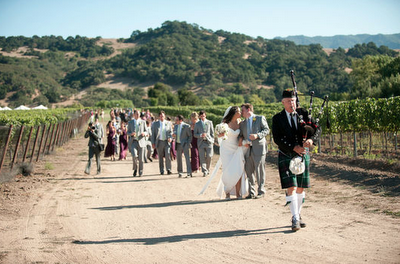 After vows were exchanged, a bagpiper led the wedding party to the reception site. The bride is the smiliest lady we’ve ever seen, and it looks like no one has more fun than the groom. Browsing through the wedding photos, Erin and I laughed and cried several times – wishing we could have been there all the while. 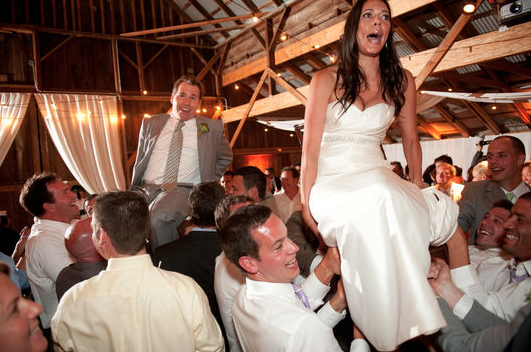 Every little detail of this event was spectacularly thought out and well-executed, but the best part is the look of joy on their faces. 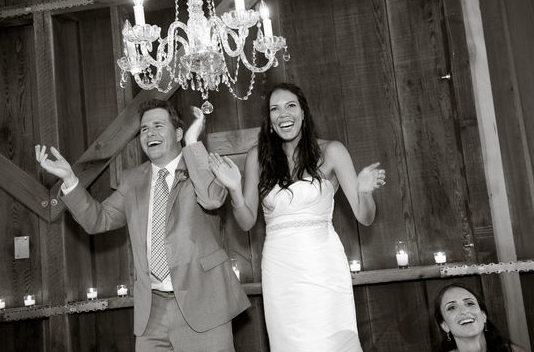 Rebecca looks as if she’s having so much fun, and John just looks happy to have her by his side. 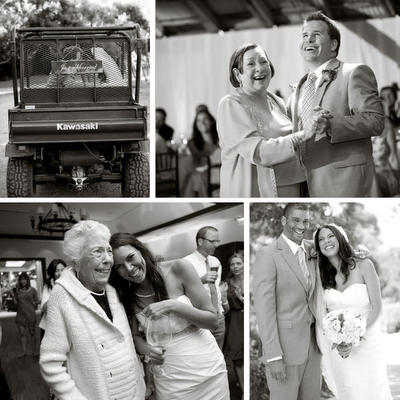 We worked with Rebecca for months, and she is one of the sweetest, most relaxed brides we’ve ever had the pleasure of working with. 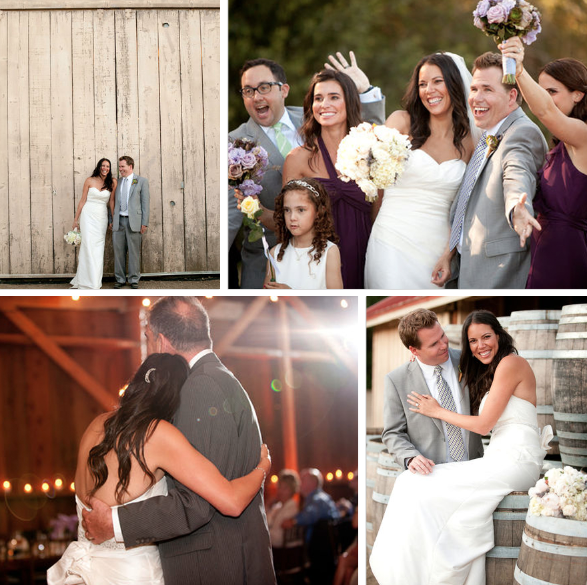 We had so much fun getting to know her, and we wish her and new hubby John the very best! 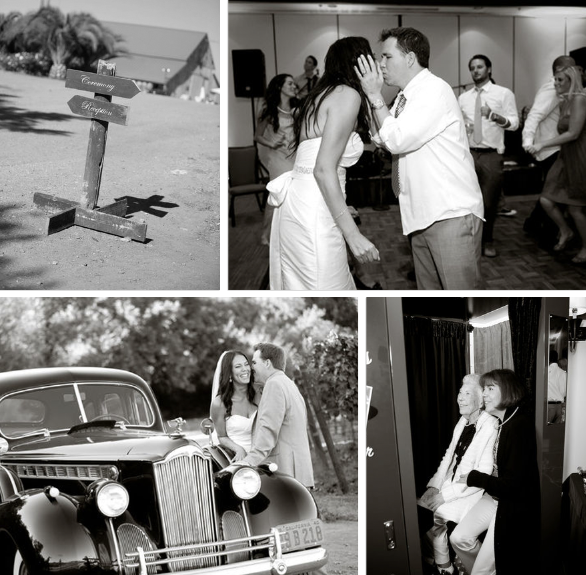 All wedding photos by Laurie Bailey Photography.